Recent reporting on the discovery and enhancement of plastic-dissolving enzymes in bacteria made me stop and think about what this might mean for the plastic pollution problem that is plaguing the oceans, including the world’s coral reefs. While this development is interesting, and draws necessary focus to the immense problem of plastic pollution in the ocean, it is premature to guess whether these kinds of enzymes might provide an effective “silver bullet” for treating plastics floating in the five great gyres of the sea. There is so much more we need to understand about the complex relationships between plastics and marine ecosystems before we can take draconian action. In other words, it’s too soon to start spraying the ocean with so-called plastic-eating bacteria. “Plastic-eating” bacteria is nothing new. After all, the untold millions of tons of various types of plastic that ends up in the sea – and in landfills – has created an absolutely huge new food source for naturally existing, and very hungry microbes. 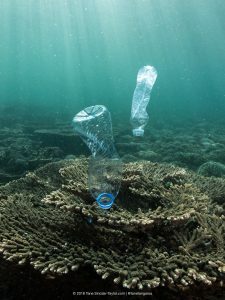 In fact, some scientists think microbes eating plastic is already an important reason that the plastics numbers do not add up – the amount of plastic we see in the ocean is much less than the total amount of plastic calculated to have been piled and poured into it. As you will see – below – much more also sinks to the bottom. There are many scientific reports of plastic-eating microbes. Similar “hydrocarbon digestion” was documented during the 2010 Gulf oil spill, when a very large fraction of the oil (recall that oil provides the building blocks of plastic) was consumed by subsurface microbes, though with significant consequences. So what is this “enhanced” enzyme and what was it designed to do? This particular enhanced enzyme was not developed to “eat” plastic. In fact, the main goal of the researchers was to identify and empower this enzyme for industrial application. The enzyme facilitates plastic recycling by breaking down some plastics (PET, #1 for all of you recyclers) into chemical intermediates that can be recovered and turned back into plastic products, thus “closing” the recycling loop, and markedly reducing solid waste from drinking bottles, the main use for PET. This concept is a big deal from a global solid waste and landfill point of view, and I’m excited to see this research grow to help solve this problem. The better we can manage waste on land, the less will end up in the ocean. What does this mean for the plastic pollution problem in the oceans? Unfortunately, this particular discovery could be much less important than the current conversation suggests. In the ocean, many types of plastic – including PET, unless bottles have lids screwed on tight! – sink to the bottom rather than floating at the surface. This means PET and similar plastics constitute only a minor fraction of floating ocean garbage patches, while most of it sinks to the bottom – where its ultimate fate is murkier. Sunken plastic is certainly a problem for the ocean, but it’s important to note that we know much less about plastic-pollution problems in ocean sediments and how it effects the myriad animals that live there and the fish that eat them. It is also not clear that this enzyme – or similar enzymes – could safely be used in wide-spread environmental remediation. Using direct enzyme spraying – or microbes engineered to deliver environmentally active enzymes – widely in the sea presents all kinds of unassessed hazards. In general, such interventions have a long history of inducing underappreciated side effects, and we would be well-served to take it slow. As with the Gulf oil spill, there is no free (bacterial) lunch. Breaking complex hydrocarbons down uses up oxygen (potentially exacerbating a different ocean problem) and liberates chemical breakdown products that together create very complicated risks, which we do not yet understand. Plus, there could be all kinds of negative effects of the materials and techniques used for treatment – like the serious problems that accompanied the use of dispersants during the oil spill. There is at least one other major issue about which we know very little. Many types of plastics actively absorb highly toxic persistent pollutants (including PCBs). It could be that ecosystem and human health risks related to both floating and sinking plastics could be greater than anyone knows, and would need to be considered before any large-scale plan is employed to deal with floating or sunken plastics problems. I fear that the oceans plastics fight will be a long, difficult slog with many unexpected twists and turns. I expect the ultimate solution will depend on good work by many people, in reducing the reliance on single-use plastics (including PET), improving the prospects for reuse and recycling of those, improving solid waste management systems, recapturing plastics on the loose – on landscapes and in watersheds, washed up on beaches, and ultimately from the garbage patches themselves. Once we tackle the problem at the source, we can start thinking about directly addressing the remaining plastic pollution accumulated in ocean gyres and on the bottom. Until then, we have much to learn and do. This entry was posted in International, Science/Research and tagged Coral Reefs, PET, plastic, plastic pollution. Bookmark the permalink. Both comments and trackbacks are currently closed.